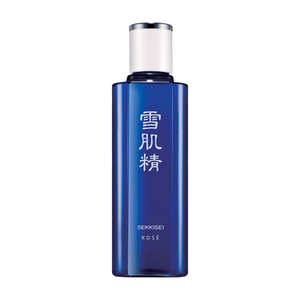 Discover a multi-purpose moisturizer with SEKKISEI Lotion Enriched, a luxurious face cream that hydrates and balances the complexion. Oriental Herbal Extracts blend with Oleic Acid to support the natural moisture barrier, soften the skin texture and reveal a natural radiance. Melting in effortlessly to treat and prevent the causes of dry and rough skin, the lotion also helps to soothe the feel of inflammation and sunburn. The complexion is left bright, supple and glowing with health. Use as a toner morning and evening after cleansing. Generously soak a cotton pad and pat gently over face. For increased effectiveness use with Lotion Mask, 1-2 times a week. Water, Alcohol, Glycerin, Angelica Acutiloba Root Extract, Coix Lacryma, Jobi (Job's Tears) Seed Extract, Dipotassium Glycyrrhizate, Hamamelis Virginia (Witch Hazel) Extract, Melothria Heterophylla Extract, Tocopheryl Acetate, Tritcum Vulgare (Wheat) Germ Oil, Citric Acid, DI-C12-15 Pareth-8 Phosphate, Ethylhexyl Methoxycinnamate, Polysorbate 80, Sodium Citrate, Sorbitan Sesquioleate, Triethylhexanonin, Ethylparaben, Fragrance.